Free User Training for DVR Examiner - DME Forensics Inc.
Join DME Forensics this July for a FREE DVR Examiner User Training course at the Magnet Training Facility in Herndon, Virginia. We want our users to feel comfortable and confident with all the great features offered by DVR Examiner, especially when they may be asked to describe their recovery process in the court room. That’s why we have redesigned our training programs to offer users free 2-day DVR Examiner training. This two-day course will cover all the basics that you will need to get up and running with DVR Examiner and understand what is going on ‘beneath the hood.’ You will explore all the ins and outs of DVR Examiner in real world scenarios. Participants of this course will receive a certificate of completion for the 2 days of training. What about DVR Examiner Certification? 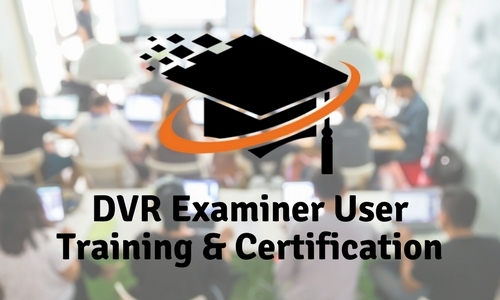 For those of you who are looking to go above and beyond the basic training, we will still offer the option for you to become a DVR Examiner Certified User. The user certification component will occur on an optional 3rd day that we dedicate specifically to the certification process. This third day will include a written examination, practical examination, and a moot court. This third day of training and certification is an optional add-on and costs a simple and flat $250. Upon completing the 2 days of training, those that have passed the examination and moot court will receive a Certified User certificate that is valid for 2 years. What if I want to renew my certification? For those of you who have already been through the certification process and are looking forward to your renewal, you will be required to complete the two-day training course and the certification process to renew. With our 2.0 release, the user interface and features of DVR Examiner has changed a lot since many of you first took training. We want to make sure every Certified User is up to speed with the new release. Why should I attend DVR Examiner training? We hear from a lot of people asking, ‘do I really need the training?’ While we put a lot of effort into making DVR Examiner simple and easy to use, it is still a very complex tool with a lot of power behind it. Understanding how DVR Examiner works, and the best practices/methodologies for using it can be critical in any investigation. So, while you may not need it to get up and running with DVR Examiner, we do recommend the training to fully maximize DVR Examiner’s potential to assist in your investigations. Why should I become a certified user? If you’re likely going to testify to the work you’ve done with DVR Examiner, we definitely recommend becoming a Certified User. Having all the available training and being certified can be critical to representing DVR Examiner in court. As anyone who has testified can tell you, opposing counsel can be very diligent in ensuring the accuracy of evidence being entered. Being able to explain your methods and how DVR Examiner operates can help defend against challenges to your evidence. What if I just need a quick “crash course” or refresher? We offer a free monthly “Getting Started with DVR Examiner” webinar will go into the basics of DVR Examiner, as well as the most recent updates to the software. As we strive to improve our product, we are constantly updating DVR Examiner. This webinar is a great way to get a quick review of our software as well as feature updates.